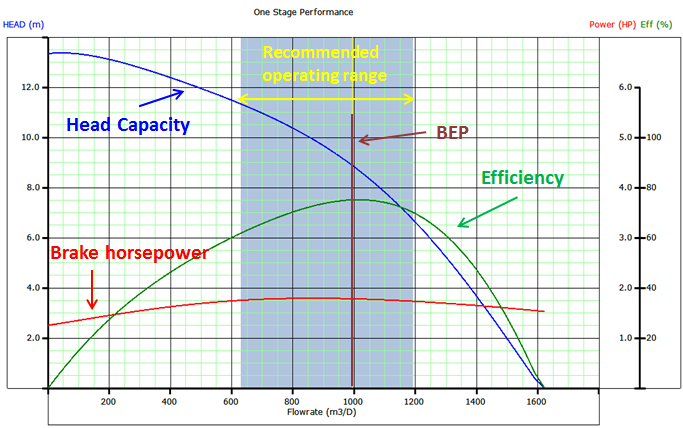 The step4 of the ESP design consists on determining the total dynamic head required to pump the desired capacity. It is common to simplify the procedure by combining or summarizing the additional energy that the pump must supply into a single term, Total Dynamic Head (TDH). TDH is a summation of the net vertical distance ﬂuid must be lifted from an operating ﬂuid level in the well, the frictional pressure drop in the tubing and the desired wellhead pressure. TDH: total dynamic head in feet (meters) delivered by the pump when pumping the desired volume. HD: vertical distance in feet (meters) between the wellhead and the estimated producing fluid level at the expected capacity. HF: the head required to overcome friction loss in tubing measured in feet (meters). HT: the head required to overcome friction loss in the surface pipe, valves, and fittings, and to overcome elevation changes between wellhead and tank battery. 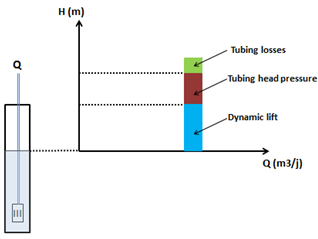 The affinity laws, also known as “Pump Laws”, for pumps are used to express the relationship between variables involved in pump performance (such as head, flow rate, shaft speed) and power. 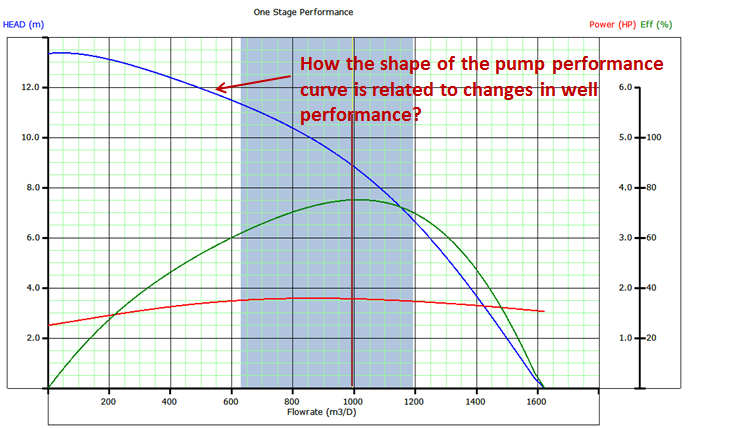 How the shape of the pump performance curve is related to changes in well performance? What are the tolerance limits of performance data? The ability of a pump to adapt to changes in well performance depends on the characteristic shape of the pump performance curve.